Each skull is a durable, complete restoration cast in resin with a spring-held removable lower jaw. They are color coded with the dark areas indicating original fossils, and the lighter areas indicating reconstructed parts. The Proconsul africanus cast of a Miocene ape from Kenya, 1948, is dated at approximately 20 million years old. 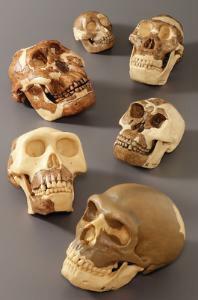 Australopithecus africanus is based on African finds 2 to 3 million years old. Australopithecus boisei (Zinjanthropus) is restored from original frontal and cranial remains from the Olduvai site, dated at 1.75 million years; the lower jaw is cast from the original found at Peninj, Tanzania, dated at approximately 1.5 million years old. Homo habilis cranium fragments, also from Olduvai Gorge, 1968 are dated at approximately 1.85 million years old. The Homo erectus modjokertensis (Pitchecanthropus) lower jaw fragment was found in 1936; the rear cranium and upper jaw with teeth was found at Sangrian, Central Java, and dated at less than 1.9 million years. Homo sapiens neanderthalensis is cast from the original remains found in the village of La Chapelle-aux-Saints, France, 1908. These remains were dated at approximately 40,000–70,000 years old. Purchase each item separately, or buy the complete set and save.